Pattern in English. Anleitung auf Deutsch. Oh, if I could only resist all those stock clearings … I still have some stash of gradient yarns, two skeins here, three skeins there … and as I guess I am not the only one, I wanted to design something easy to use up any rather small amount of gradients, that is not enough for a pullover but too much for a hat. 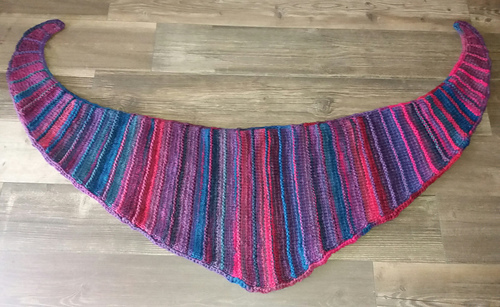 It was real fun to make SNUGGLY SNUGGLE as the shawl knits up very quickly, and the colour gradients do the trick. 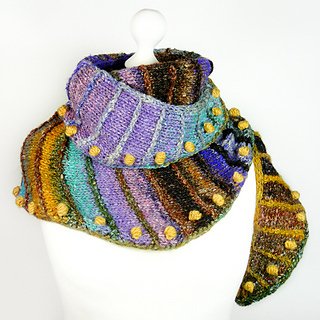 I love NORO yarns, but I always have the feeling that I have to tame them a little bit – here I added small garter ribs to frame the bold colour blocks. Designed for using up these two skeins (200g g) of NORO OBI yarn or any other variegated and rather thick yarn that still hides in your cupboard, SNUGGLY SNUGGLE is a real stash buster. A quick and easy knit, the shawl with its elongated crescent shape makes a great present for friends and family, female and male alike. Beginners who want a little challenge and learn something new will like the step-by-step instructions. Crocheted bobbles add fun, but if you find them too playfull, just skip them. The pattern is easily adaptable for different yarns and sizes. I recommend yarns with long gradients. Use skeins of the same colour number for not having too many leftovers. If you buy the pattern via ravelry, you will get both the English and the German Version. Weihnachtsgeschenk! Die Anleitung ist ausführlich und für abenteuerlustige Anfänger geeignet. Die Anleitung lässt sich leicht für andere Garne und Größen abwandeln. Ich rate zu Garnen mit langen Farbverläufen. Verwenden Sie nur Garn aus einer Farbnummer, um übermäßige Reste zu vermeiden. Wenn Sie die Anleitung über ravelry kaufen, erhalten Sie sowohl die deutsche als auch die englische Version.